If you live in the UK, whether in a large city or a small village, you have probably heard the sound of church bells. Bells have formed part of life in this country since the Middle Ages. Church bells are the biggest and loudest musical instruments in the world. Their sound can be heard miles away from their towers. Bells are rung to call people to church, to celebrate happy occasions and commemorate important events. They are also rung simply for the enjoyment of hearing their sound. Most church towers have bells. A set of bells is called a ‘ring’ or a ‘peal’. Village churches may have a small ring of bells, comprising five or six bells. Bigger churches and cathedrals usually have a larger ring. The bells are hung in a frame high level with the large openings at the top of the tower. Each bronze bell has a clapper inside, which swings with the bell. The bells are each attached to a wooden wheel, which has a rope running round it. The rope drops down into the ringing room two floors below. The coloured part of the rope is called the ‘sally’. How do you make them ring? Each bell is rung by a different person. 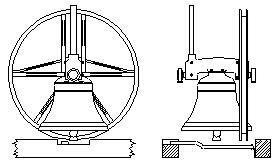 When the ringer pulls on the sally the wheel and the bell rotate through 360°, and the clapper then hits the rim of the bell, making it ring once. When the ringer pulls the rope for a second time, the wheel rotates again by 360° and the clapper hits the opposite side of the bell. This action of ‘handstroke’ and ‘backstroke’ is repeated until the ringing stops. What do the bells play? Although a group of bell ringers is called a ‘band’, British church bells do not play recognisable tunes. The music that they make is created by ringing the bells one at a time in ever-changing sequences. Each bell is numbered. In a ring the highest bell is number one and called the ‘Treble’ and the lowest bell is called the ‘Tenor’. The simplest pattern is to ring the bells in order, highest to lowest (smallest to biggest). Ringing the bells in numerical order is called ‘rounds’. Ringers practise hard to ensure that a regular pulse is maintained throughout the round. To make the pattern more interesting, the next time the bells are rung, the order is varied. This is called ‘change ringing’ and it developed in the 17th century. There are many different ways of varying the ringing order (or ‘ringing the changes’). Each piece of change ringing is called a ‘method’ and each of method is given a name (such as Plain Bob, Stedman, and London Surprise). New methods are being composed by ringers all the time. A method always begins and ends with rounds, and then changes are introduced, using the mathematical sequence or ‘method’. This enables the ringers to know when they should ring their bells. No two combinations of bells (or ‘changes’) are the same. Ringing every possible combination on St Mark’s bells would take around 24 hours non- stop! However ringers usually ring set pieces comprises 100 to 300 changes. You can progress to quarter peals, which comprise over 1250 changes and last about 45 minutes. Some ringers specialise in full peals, which last three to four hours! Ringing is a fascinating social and team-based activity, which is not only a service to the community, but a challenging and addictive hobby. You are welcome to come and watch us ring: please get in touch. We look forward to meeting you! Example of a section of a “method”, the ringers learn the line of travel through the changes, here illustrated in blue. The red line indicates the path of the treble bell.